Retail Outward: Check Out Puma! I just came across this fascinating article titled Puma Employees Become Ambassadors. It immediately had me appreciating what an interesting example of Retail Outward Not Inward: Time To Refocus this represented. According to the article, Puma wants to 'inject some personality into its brand by enlisting its employees to share their thoughts in a retail marketing campaign." More specifically, the campaign will features pictures and thoughts of 14 employees who will also be involved in in-store and other events. For those not able to participate and get to know these star Puma employees in select markets [i.e., Boston, Chicago, Houston, Los Angeles, Miami, New York and San Francisco], follow along via the Puma Facebook page which already numbers 1,234, 128 fans [as of 8/30/09]. According to the Puma chief marketing officer, "Puma employees around the world are some of the most colorful and dynamic people." I love that this program engages Puma employees so intensely. 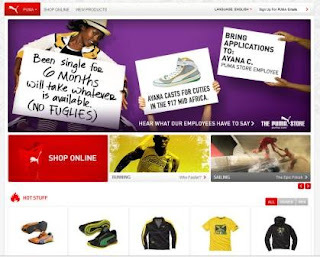 The only way it can truly work as a tool of customer engagement is if Puma employees are fiercely passionate about the Puma brand. And, from what I can see, they are. Per Got Something to Say? PUMA® Lets You Speak Your Mind!, thousands of employees have taken part with videos uploaded to the Puma YouTube channel. The Puma Employees Only campaign launched on August 15th through September 30th featuring seven local employees in each city. PUMA will return for the holiday season with seven new executions and seven new employees featured in the campaign beginning November 15th through December 31st. In terms of retail outward concepts, I find Puma's campaign fascinating: by showcasing and celebrating its employees, who are the first and most powerful brand voices that a consumer encounters, the company creates a strong point of connection and engagement with its customers. And, in those select cities, consumers are invited to share their opinions, too. I'm intrigued and curious. This campaign has the potential to transform the Puma brand into one that truly connects with customers... in which case I see this no longer being a campaign, but rather a new way of being. Now, as it relates to your retail experience, how might you implement your own 'Employees Only' program? How might you so intensely engage your employees that they become your most passionate brand ambassadors imaginable? 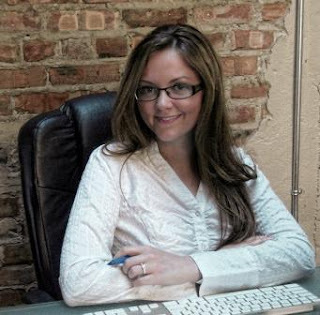 This week's guest for Flooring The Consumer's Social Media Series: Bridging New & Old is Natalie MacNeil. Natalie MacNeil lives, breathes, writes and exudes encouragement for entrepreneurs. By day, she is a media producer and freelance consultant living in Ontario, Canada. At other times, she inspires and supports women entrepreneurs -in particular- via her blog She Takes On The World. Be sure to also check out her Garage Entrepreneurs blog which documents her team's entrepreneurial journey and provides advice and insight into a variety of entrepreneurial and small business topics. 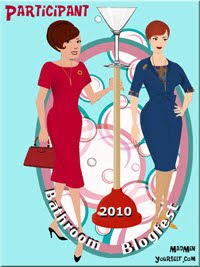 Natalie and I connected via Personal Branding Magazine Issue 8 Re: Female Power Brands in which we were both featured. I was struck by her passion for entrepreneurship, her practicality in business, her skill at meshing traditional approaches [e.g., she started out running a lemonade stand] with new ones and her interest in women business owners. Since running that first lemonade stand, Natalie hasn't wasted a moment. She has been been recognized as one of Canada’s top young leaders, run a successful customer service auditing business [yes, we also connect re: the customer experience], been Ambassador to Canada and traveled, as a result, to over 50 countries to date. 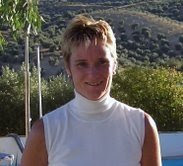 Here is a link to Natalie MacNeil's personal website which includes her Twitter contact info. C.B. : Natalie, how/why did you get involved in social media? Natalie: Being involved in social media is absolutely essential today -especially for business owners. I really believe not getting involved in social media will hurt your bottom line. I first got involved with social media when I started a personal blog which eventually evolved to become the business and entrepreneurship blog it is today, She Takes On The World. As more and more social media tools were introduced I wanted to try those too. Suddenly I was using 30 different social media platforms and seeing results. My personal network grew and my business grew and that made me want to really develop a strategy for using social media. I use it frequently now because I realize how powerful it is and the impact it has on business-customer relations. It is fascinating to see it transform media, marketing, and customer service. Natalie: My favorite thing about social media is the sharing of knowledge. Everyday, millions of people from around the world are sharing knowledge with each other and that is powerful. Look at the role twitter played following the election in Iran. The impact of social media is incredible. It gives people a voice who otherwise may not be heard. Natalie: The absence of a regulatory body or someone to check facts and make sure the information people give is credible can be a problem. There is a game I remember playing in elementary school. Everyone would sit in a circle and the teacher would whisper a sentence into someone's ear and that person would pass it on until it got passed around the entire circle. The last person to hear the message would say it out loud and often times the message would be completely different by the time it got all the way around the circle. Social media sometimes works in the same way. As people pass on information, the story continually changes and the line between what is fact and fiction gets blurred. 1) Build relationships with your customers without trying to sell them anything. Focus on personal connections and building trust among your customers. People know when you are using social media for the sole purpose of selling and will avoid interacting with you. 2) Be creative. Don't just use social media how everyone else is using it. A great example is a bakery in London that informs its twitter followers when fresh bread and baked goods are coming out of the oven. The whole process is automated and the company has received a lot of international attention and media coverage. 3) Monitor what people are saying about your brand online and engage in conversations with the people talking about your brand. If they have something positive to say, let them know you appreciate them sharing their positive experience and feedback. If they say something negative, follow up with an apology and ask for suggestions. I blogged about a terrible experience I had with Home Depot. They did one thing right by emailing me an apology. What Home Depot failed to do was follow up on how they can improve and make me happy as a customer again. 4) Build a community around your brand. I think Walmart has done this effectively. People can review products and Walmart uses its community to interact with customers and make improvements. Building a community for your brand can be a very powerful tool for marketing and is the ultimate way to connect with customers. 5) Appoint brand ambassadors. Hire influential people online to engage in conversations about your brand and get feedback. Make your brand ambassadors feel like they are worth gold to your company -because they are. - Be mindful of what you say and how you say it. - Focus on providing value to the conversations you engage in through social media. - Think of your time spent using social media as an investment and plan a strategy for how you can get a return on the investment of your time. You never know who is watching you or your brand. I have been offered jobs, business, and wonderful opportunities all by leveraging social media and you can, too! I love Natalie's suggestion to be creative. What are the most creative uses of social media that you've come across? What do you think of her characterization of time spent using social media as an investment? How do you get a return on that time as well as on your traditional activities? How effective are you at developing relationships without selling anything? For additional insights from other participants in the Social Media Series: Bridging New & Old, please visit The Entire Bridging New & Old Series. Retail therapy originally uploaded by maistora. According to Kurt Salmon Associates [KSA] and their 2008 research of 101 U.S. retailers, there's an intense retail shakeout going on. Only those who adopt an "Act Vertical" strategy can survive the recession. See The Act Vertical Imperative. So, what is "Act Vertical"? It's a radical departure from traditional retailing - which sees itself as the "purveyor of national product brands." You know, the kind of retailing that doesn't inspire shoppers, doesn't make for memorable customer retail experiences and does nothing to address customer wants and needs. Rather, "Act Vertical" means serious product innovation [vs. just merchandising], collaborating with customers and suppliers, controlling quality without owning manufacturing, offering compelling services that lead to customer insights and additional innovation as well as memorable and engaging customer experiences -- which lead to a virtuous circle that further strengthens customer relations. + marketing that communicates the brand promise and the uniqueness of the offering. The KSA research uncovered that retailers have many opportunities ahead - particularly if they want to appeal to consumers for reasons other than low price and high convenience. More specifically, those retailers intent on creating unique and compelling products with a strong in-store customer experience significantly out-perform other retailers. That gets my attention. Does it get yours, too? Here's another interesting point: most websites provide a higher degree of product information than consumers find in-store. No surprise. They also provide essentially NO product usage information to customers once they purchase. Wow! What an opportunity. That's right! What an opportunity to engage with customers and continue to provide them with value on how to care for their purchase, what to be aware of, how to deal with emergencies, etc. I discovered this KSA research report through Retail Customer Experience's The seven competencies retailers will need to survive the recession. I urge you to email KSA at ActVertical@KurtSalmon.com or to click on the link above and request a copy of this report. Then, would you let me know how you Act Vertical? 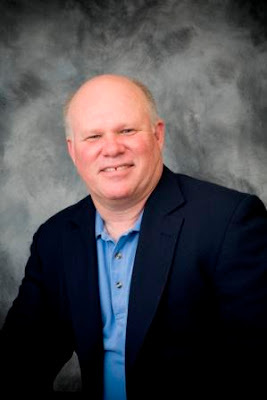 This week's guest for Flooring The Consumer's Social Media Series: Bridging New & Old is Paul Chaney. Paul Chaney is without a doubt the Social Media Handyman. His approach is grounded in practicality and relevance to business. For example, did you know that Paul has served as Technical Editor on a number of For Dummies series books related to blogs and Internet marketing? And, a contributing writer to one of my favorite books: Buzz Marketing with Blogs For Dummies? What caught my attention and imagination when I first 'met' Paul in 2007 - during Toby Bloomberg's Diva Marketing Talks Blog Talk Radio program - was his focus on encouraging Realtors to adopt blogging as part of their marketing strategy. BTW, he contributed "Never Start Building Without First Counting the Cost" to The Age of Conversation 2 - Why Don't They Get It? - the book that 237 authors from around the world collaborated on to benefit Variety, the children's charity [please consider buying the book]. Paul definitely extends his 'handyman' approach to his day job as Internet marketing director for Bizzuka, a Web design and development company based in Lafayette, LA, where he incorporates new media marketing strategies and techniques into the marketing mix, with programs like User Friendly Thinking on BlogTalkRadio. But, that's not all! Oh, no... There's more. Lots more! Paul serves as president of the International Blogging and New Media Association (IBNMA), an organization dedicated to advancing the growth of blogging, podcasting and social media as an industry. He sits on the board of advisors for the Women's Wisdom Network, the Social Media Marketing Institute, and SmartBrief on Social Media. He is a feature writer for Practical Ecommerce magazine on the use of social media for marketing purposes and blogs for MarketingProfs Daily Fix. C.B. : Paul, how/why did you get involved in social media? Paul: Oddly enough I got involved in social media two times. The first was back in blogging's heyday. I've always been somewhat of an early adopter and started playing with blogs in 2003. I had seen Blogger prior to that (2001 maybe), but it made no sense to me at the time. By the time Typepad was introduced, however, it began to click. Others in my field were experimenting with blogs and I could better understand the medium. Still, it was early. For example, I attempted to incorporate blogs into the organization I served as director of online communications, but it failed to catch on. We were using email marketing heavily and had begun to experiment with RSS. However, they weren't ready for such an open, interactive, direct form of communication so it never gained traction. In lieu of that, I started my own blog and began to write about all things Internet marketing-related. Blogging released my inner writer and I found myself becoming almost addicted to the medium. I also found myself writing more and more about how to use blogs for business purposes. In 2004, I struck out on my own, became one of a handful of business blogging consultants and set about to build what we now refer to as social capital. I helped start a blogging software company - called Blogging Systems - that targeted the real estate industry and co-authored a book on real estate blogging, Realty Blogging: Build your Brand and Outsmart Your Competition. Somewhere in 2007, I sort of fell off the wagon, but only for a short time. I was watching the landscape change from an emphasis on blogging to what was being referred to as social media. It dawned on me that, unless I wanted to be a relic of the past, I had better jump back on the bandwagon and become familiar with this new publishing genre. With the help of two people in particular, Ann Handley and John Moore, I reinvented myself and went from being the "blog coach" and became the "social media handyman." While I still harken back to blogging's good old days on occasion, I thoroughly enjoy participating in this "terra incognita" that is social media, with a view toward proving its value as a marketing communications tool. Paul: Connecting and interacting with people. Social media is the most human of all forms of marketing and I like the genuineness of relationships that can develop thanks to it. The best friends I have in the entire world came through social media interaction and I'm happy to say I've had the opportunity to meet many of them in real life. Paul: I find many people are attempting to "game" it using direct response marketing tactics. They don't understand that the way you market in this genre is different than how marketing is done otherwise. It's less lead generation marketing and more an information sharing form. That's not to say leads can't be developed using social media, for certainly they can. It's just that it's not the fast road, but, rather, the high road. It's relationship marketing where trust is built over time. "Slow and steady wins the race" is the lesson of the tortoise and the hare, right? Akin to that, people are adopting the toolset of social media without first understanding the mindset. Today, "markets are conversations" as the Cluetrain says. Therefore, participation is marketing , and not blatant ballyhooing. St. Francis of Assisi put it this way, "Seek first to understand, then be understood." That how social media marketing should be done. It begins with listening. Paul: Good question, because I'm not just a marketer, but a consumer as well. One thing that's changed is that I rarely purchase a product or service, even consider doing business with a particular brand, without first checking with my peers. Word of mouth recommendations are the most valuable form of marketing and I rely on it when making my own purchases. Social media has put WOM on steroids. No longer is it a matter of checking with just a few close friends. I can glean the experiences of many people. First, understand that social media is not just a toolset, but has an underlying mindset. It's not just a matter of "how," but "why" as well. There is a reason universities teach theory and principles courses first before practicum. Social media has its own set of both and to be ultimately effective, one has to understand what those are. Second, learn to listen before you talk. God gave you two ears and one mouth for a reason. Listening is the new marketing. By listening, you hear what's being said, who's saying it and where the conversation is taking place. Listen for three things: Share of voice, tone of voice and trends over time. Third, get a seat at someone else's table. By that I mean, once you've determined where conversations about your brand are taking place, engage consumers there. Two places where this is happening routinely are Facebook and Twitter. You cannot get past these two behemoths, especially if you're in a B2C environment. Fourth, set a table of your own. It's not just a matter of going to sites like Facebook, Twitter, LinkedIn or others and joining in the conversation. Start one of your own. If anything, the recent acquisition of Friendfeed by Facebook has taught us that it's good to have a place to call your own. For example, a blog can be your social media headquarters. If your consumer base is large enough, consider starting an online community built around your brand. Fifth, measure the effects of the conversation. That's an unpopular topic among many in social media, simply because they have deemed it difficult to adequately measure the impact. I beg to differ. Social media marketing is still marketing and is, therefore, subject to the same statistical scrutiny as any other form. Also, software is being developed right now to make the job easier. Lastly, when we're talking about measurement, we're not meaning just quantitative, but qualitative as well. Some measurement can't have a number assigned to it. Bottom line, the CEO wants to know the ROI of SMM! That's not going away whether we like it or not. Paul: Simply, you'll never know how well social media may serve you unless you step into the water. There are many books available, including my own, that will give you all the information needed to begin the engagement process. Social media marketing conferences take place all the time across the country too. Those can be good venues for learning as well as networking with others. Jump in! The water is fine. What do you think about Paul's statement that "the way you market in this genre is different than how marketing is done otherwise. It's less lead generation marketing and more an information sharing form"? I love his characterization that "listening is the new marketing" as well as the notion of setting a table of your own and getting a seat at someone else's table. Have you had a chance to review the latest Wharton retail research about shopping experiences? Wharton's Jay H. Baker Retailing Initiative with Verde and the Retail Council of Canada teamed up for the sixth annual study of the state of shopper satisfaction in North America. The result? 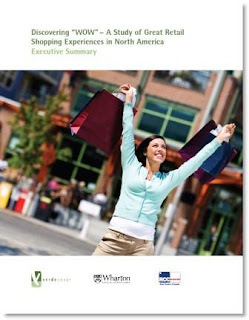 "Discovering "WOW" - A Study of Great Retail Shopping Experiences in North America [link to Executive Summary]. The latest research results were described in Knowledge@Wharton's Getting to "Wow": Consumers Describe What Makes a Great Shopping Experience. + "Brand experience and engagement are the strongest drivers of loyalty... Brand experience includes store design and atmosphere, consistently great product quality, making customers feel they're special and the sense that customers always get a deal." + "Speeding the shopping process is another important trait of a great retailer." 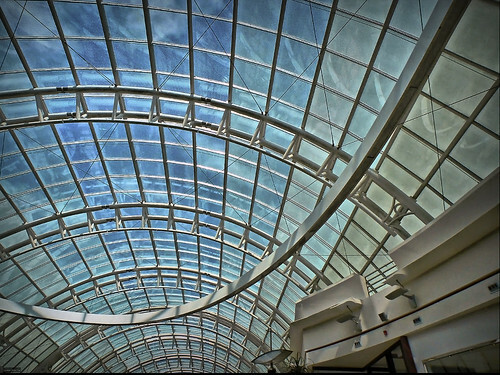 + "It is important for retailers to have a clear, simple problem resolution process. 'The biggest issue is problem-ownership.'" +"Today's economic crisis is leading consumers to focus more on value than price." + Great store experiences result from multiple elements "70% [of respondents] said their shopping experience was great due to six or more elements occurring during the shopping trip in question." + "Shoppers care about quality." + The better the shopping experience, the greater the loyalty. + The five categories of great shopping experiences include: engagement, executional excellence, brand experience, expediting, and problem recovery. + Men talk more about great than women... but women care more about great than men and "great shopping experiences ... inspire women to action and loyalty." What have you observed with your customers? Do the results of this study match up? How do you create "WOW" shopping experiences for your consumers? This week's guest for Flooring The Consumer's Social Media Series: Bridging New & Old is Anna Farmery. Anna Farmery embodies engagement. But not just any kind of engagement. Anna's form of engagement inspires; it's beautifully and elegantly simple and to the point, practical beyond belief and oh-so-very-wise. Spend time on her blog, The Engaging Brand, and you'll know what I mean. You'll find yourself motivated not just by what you read there, but also by what you hear in her weekly Engaging Brand podcast. Anna contributed "Nobody Puts Baby in a Corner" to The Age of Conversation 2 - Why Don't They Get It? - the book that 237 authors from around the world collaborated on to benefit Variety, the children's charity [please consider buying the book]. This snippet from her chapter highlights how valuable she considers listening and engaging: "The next time you hear the baby cry, remember the power of the voice, remember as a leader or a parent the way to succeed is to value that cry and dedicate your life to nurturing that relationship." Her intense focus on connecting, inspiring and motivating -- powered by social media -- make her comments about Bridging New & Old particularly insightful. C.B. : Anna, how and why did you get involved in social media? And not just with The Engaging Brand, but also Buzz Networker, The Podcast sisters and Widows Quest? Anna: I so wish I could say it was through a focused strategy but it was by accident. When I started my company I put all my savings not in the company as people may suspect, but in a 5 year investment - why? Because I wanted to create that sense of danger, risk, desire that entrepreneurs have when they first start their companies. That meant I only had £500 which didn't stretch very far...so I had to look at new ways of generating interest in the company. I hadn't a clue how podcasts or blogs worked but spent every hour of every day working it all out....and the rest is history as they say. For small businesses social media is a wonderful way of connecting and growing your business. Investment is still needed but it is a passion and time based investment rather than a monetary one. At first the passion for blogs and podcasts was as a consumer. I loved learning, connecting and expanding my view of the world. Then I realised that if that is how I felt why not try it for yourself, Anna. I actually started on blogger with a blog called MabelandHarry which I haven't kept going. This was me finding my voice. I wanted to learn to write as Anna rather than write for the web. I think it is important to find your voice. I then realised how social media gave me the ability to speak directly with people rather than being quoted or having to somehow buy media space. What is more powerful than speaking into the ears of potential consumers? Podcasts are highly personal, highly intimate and I believed in the power of the voice. The Engaging Brand was not meant to be part of my company, it was my way of keeping my late Dad's legacy alive. He had lived his life trying to help others achieve success, he was a greater giver and the blog was my way of sharing the lessons I have learned during my 20+ in corporate life. The other blogs are really because of my passions. Widows Quest and Buzz Networker I write for B5 Media. Widows was about reaching out to people and helping them through changes in their lives and Buzz because I find that people want to know more about social media, the trends, the successes and failures. The Podcast Sisters was my idea to reach out to other small business owners who want to join the social media revolution but find it all too geeky. I record with Krishna De and Heather Gorringe not to "geeks" but people who want to understand all the terminology and more importantly how we use it to grow their businesses. Again as my way of giving back to the business world. C.B. : Anna, what about Facebook. I remember you being the first person who made me reconsider Facebook as a serious platform. How do you use it and has that changed much? Anna: As you know I love people, I love learning and social media really suits my personality. I just love, passionately love, conversations and learning about people. Social media allows me to have conversations under the guise that I am working! As a business owner, social media doesn't just allow you to connect with consumers but also helps you develop your thinking. My connections on social media are mentors, friends, coaches, motivators....and you realize the more you give, the more you grow and the more your business grows. Anna: I think it is easy to become overwhelmed by it all, I think it is easy to lose focus and I also think it is easy to become insular. That last statement seems counter intuitive but the old "echo chamber" can become real if you don't constantly keep searching for fresh ideas, fresh perspectives and fresh connections. Anna: Totally. I mean I have been a Director in FMCG companies all my life and social media has revolutionized the way I think....actually being truthful not necessarily the way I think but it gives me the ability to do what I always wanted to do - which is connect with the consumer directly. 80% of my business this year has come via an initial contact through social media. I find through social media I become a friend rather than a supplier which makes business easier in the long run. Friends trust friends. Social media allows you to be you in a natural way, rather than how someone else wants to portray you. a) For me it is not a choice between old and new. It is about what do you stand for, who do you want to connect with and therefore which are the best tools for delivering against those aims. b) I liken social media to building a town. Twitter are the conversations which happen in the street, blogs are your community newspapers, podcasts are your radio stations, flickr your art gallery, coffee shops are your social networking sites, etc. You cannot force community in a town, you can only build places which encourage community. c) Think not about what you want to say but what problems are creating the search. Be the consumer, think like the consumer, and talk like the consumer. Then create content which answers the problems rather than selling your products. d) Always remember the saying...Be you as everyone else is taken. e) I always say at the end of each podcast "People will forget what you said, people will forget what you did but people will never forget how you made them feel." This is a quote from Dr Maya Angelou and I think that should be the mantra of all business people. Anna: Remind yourself each day that your brand is your promise. Be clear about what you promise is and spend each second delivering that promise consistently every day of your life. How have you used social media to better connect with your customers? Have you found it as powerful as Anna has? I love Anna's characterization of social media as building a town. The image is powerful and captures the interrelationships and levels of conversation. What do you think? What about 'creating content that answers problems'? Doesn't that seem much better than simply trying to sell products? Flooring Retailers: What Parquet Design Is This? Flooring Retailers: we need your help! Can you identify this wood parquet design? And, is there a simple way to repair or restore it? 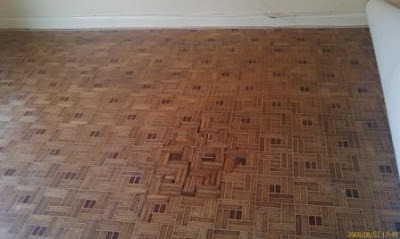 Karin Hermans from Wood You Like Ltd in the UK asks the question as she wants to help a homeowner restore this wood parquet to "its original pride." As she describes the situation, "this week we received a 'cry for help' on how to restore an IMHO unique pattern in wood Design Parquet. I had to ask for images because the explanation over the phone how the pattern was laid didn't ring any bells with me. (After receiving the images we urged the lucky owner not to rush into things - he is moving into the house next week - in order to find the best ways to bring it back to its original pride)." 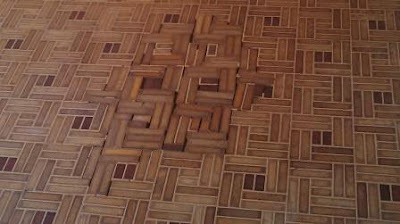 Above, you see a closeup of the parquet design. I've also uploaded a higher resolution image in case you want to magnify and look more closely. From research - or, as Karin describes it, "putting on her 'detective' head" - she has determined that this is/was a pattern commonly used in the USA. Furthermore, the grouting between the individual blocks is cork. Although the wood tiles were apparently 'pre-fab,' they still took a lot of labor to install. If you have information to share, please let me [cbwhittemore[at]gmail[dot]com] or Karin [info[at]wood-you-like[dot]co.uk] know. ~ C.B. 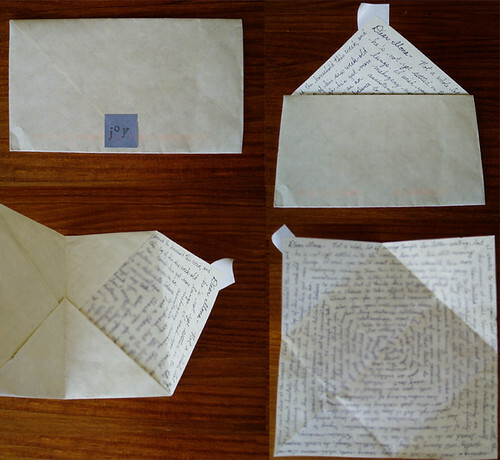 "Sherlock Holmes" and "Dr." Karin "Watson"
Spiral joy letter originally uploaded by Green Velvet. According to Recession Forces New Focus In E-Commerce Marketing by Anne D'Innocenzio, a Forrester Research/Shop.org industry study released on 05/05/09 states that online retailers are shifting "their marketing from traditional advertising to less expensive tools such as Facebook, Twitter and e-mail as they seek market share or just work to retain customers." In this case, traditional advertising seems to refer to expensive search marketing programs and retailers are looking for increased efficiency [something at the heart of my MarketingProfs Daily Fix post "Ignite Your Consumer-Dealer Sales With Dealer Ignition's Dealer Promotion Network"]. The article mentions a focus on email marketing which 90% of respondents consider a top priority. That caught my attention. It's a potent tool and yet not one that I've seen readily embraced by many flooring retailers, for example. According to the study, "retailers are getting more sophisticated about using e-mail to attract and retain specific customers they already know" and over 70% intend to "send targeted e-mails based on customers’ stated preferences or past purchases." What a terrific way to create engagement with customers and integrate information you know about them from other sources. This timely article describes how email plays a role for High-End Retailers Offering More Discounts. In addition to email, the article refers to social media. Despite skepticism "about the sales potential for marketing in social media like blogs and social networks, the study found that companies that are growing faster than expected are more likely to embrace such initiatives." That had me thinking about Charlene Li's new study: Deep brand engagement correlates with financial performance. What about you? What are you doing online and in-store to gain market share and retain customers? How are you changing what you do? And how are you integrating social and email? Time for a Simple Marketing Now update! Over at the Simple Marketing Blog, I write about marketing strategy and creative, practical, simple marketing approaches and best practices - many of which may be relevant to you and your businesses as you explore what's possible. The blog also acts as newsroom for Simple Marketing Now. If you haven't already, perhaps you might check it out? Possibly even subscribe? And maybe even tell others? Here follow highlights from this past July 2009. In the news was the recently issued Press Release: Whittemore Delivers Social Media Presentation to NJ Executives In Transition. I plan to detail some of the questions that came up as well as the resources I shared in an upcoming post. 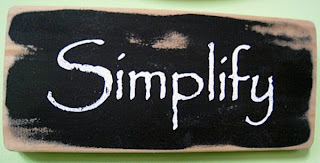 If you missed the earlier post about it, please read Subscribe To News From Simple Marketing Now! [and, don't be shy about subscribing!]. I'm definitely on a Twitter roll. Starting with Steven Berlin Johnson at MarketingProfs B2B Forum who wrote a thought-provoking Time article about how Twitter will change our world... Next, I wrote about Marketing With Twitter and Perspective on How Best To Use Twitter. I published another case study, this time about The Carpetology Blog. I'm interested in your thoughts about Barry Schwartz Promotes Practical Wisdom. Barry Schwartz authored Paradox of Choice [about the need for simplicity...]. Here he addresses another need: that of practical wisdom. I see applications all around me and particularly as it relates to the customer experience. Finally, did you know that Fiskars, the scissors company, will be 360 years old in October? Yet, it's an amazingly young and creative company as you discover in Fiskars: 360 Years Young & Innovating With Customers. What lessons might you apply to your business? Be sure to look for Simple Marketing Now on Facebook, too. I've just created a page and welcome new fans! Thank you for your interest and support. I appreciate it.